Weddings, Life Celebrations and Concerts - Our spacious Sanctuary accommodates a whole range of events, from the celebration of a new marriage, or the joyful noise of a jazz/gospel concert, to the solemn remembrance of a loved one. Performances and Parties – Our varied alternative spaces have hosted jazz, choral and classical performances, catered gala events and small memorial services. Neighborhood dance parties and mid-life birthday celebrations are popular, as are community dinners. Classrooms - Teachers and students alike find our spaces calming and reflective for Tai Chi, yoga and meditation. 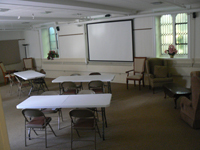 Meeting rooms - Teachers have gathered for workshops and continuing education courses. Our sacred and spacious Sanctuary, with sunlight streaming through historic stained glass, is especially inviting for weddings and is an emotionally powerful space for memorials and concerts. 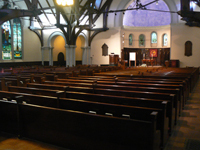 First Parish is a Welcoming Congregation, and invites couples of all faiths for wedding ceremonies. Seating capacity is 475. Standard usage fee is $1,200 per event. These adjoining rooms feature clear, southeast-facing windows with views of a woodland hillside. Their warm and inviting feel make them a favorite location for receptions, workshops, and festive cocktail parties. Lyon Chapel and the more intimate Peterson Room connect through doors that can disappear into the walls, facilitating easy access to the Kitchen. Capacity is 100 seated and 200 standing. Standard usage fee is $600 per event. 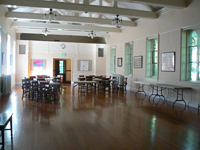 The original Town Hall of Brookline, the room has a wooden floor, east- and west-facing windows, and is a great space for dance parties, receptions and large workshops. 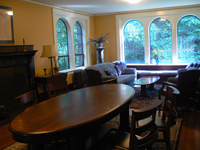 Like the Peterson Room, Pierce Hall has easy access to the Kitchen. Capacity is 120 seated and 240 standing. Standard usage fee is $600 per event. Our intimate Dana Room is ideal for small meetings and workshops, with an available sound system, as well as projection equipment and screen for showing films. Capacity is 30 seated. Standard usage fee is $75 per hour. 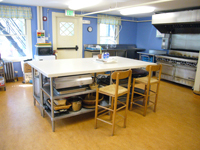 The Kitchen, connected to both Pierce Hall and Peterson Room, is well positioned for catered events. It features a central island, modern and professional stovetop, ovens and fan, dishwasher, and caterer-friendly sinks. Like a friend’s home, the Kitchen often becomes a secondary gathering place during events. Usage fee is $100 per event. Space availability, assignments and rental negotiations are all handled by the Parish Administrator. Pricing is locally competitive and uses a sliding scale factoring in church membership and non-profit or for-profit status of the renter. We encourage recurring and longer-term rentals. Custodial staffing, priced separately for duration of events, is required of all non-member rentals. First Parish is a place to celebrate and make lasting memories. If you haven’t seen our facilities, you’re welcome to pay a visit -- and you really should before planning your event. All you need to do is contact our Parish Administrator by phone, 617-566-1933, or email .